According to statistics from the National Association of Home Care and Hospice, therapists, nurses and home care aides drive one billion miles to care for patients in their homes every year. Many of these patients are shut-ins and cannot receive out-patient Physical Therapy or other services, but therapists are increasingly playing a role in the recovery of patients – particularly following surgery. The home care component of rehab is an important aspect of the continuum of care offered by Physical Therapists. Understand that Medicare is an important aspect of home care. They are the primary payer of home care agencies that serve people in their home. Medicare will only pay for patients who are considered home bound. This plays a role following a patient’s surgery and inability to leave home. There are circumstances in which a patient can leave home. These include Dr. visits, attending church or a funeral. Even attending a graduation is acceptable. For the most part, home care services are for people who cannot leave home. Physical Therapy and Occupational Therapy is often required following surgery such as a total joint replacement. Oftentimes return to home following surgery is difficult. Many times nursing is required to oversee a patient upon return home. Blood work is often needed following a joint replacement. Taking medication that reduces blood clots is required Nursing can monitor the response to blood clot medication and report this to their physician. They also monitor wounds for infection and are skilled in dressing management. The communication between nursing, the therapist and physician is valuable and plays a great role in the recovery of a patient. Physical Therapists, Occupational Therapists and Speech Therapists all serve to perform rehab in the home care setting. These are all reimbursable services provided by Medicare and other private insurance companies. This is a very valuable service particularly in the recovery of a patient following a difficult surgery. Therapists work with people in a person’s most important setting – their home. Here, activities of daily living such as walking, bathing and self-care can be worked on and improved. Following a total joint replacement, activities such as climbing stairs and getting in and out of shower can be extremely difficult. Therapists are skilled in providing ways to improve these activities and make them successful again. Therapists provide needed therapeutic exercise and activities to ensure recovery. Monitoring of these exercises and improvement towards goals are reported to the physician. Compliance with these exercises is a very important aspect of recovery, particularly with the management of a patient following total joint replacement. An example of this is Brenda following her total hip replacement surgery. “I couldn’t go up and down stairs without the fear of falling. The therapist came in my home and taught me how to do it” Climbing stairs with crutches can be a very difficult task (especially the older we get). “The exercises the therapist made me do helped me get stronger.” Patients are weak and sore following surgery. Physical therapists and occupational therapists teach strategies to assist a patient in becoming safe and teach exercises for strength and range of motion improvement. This is a great way to ensure there is no return to the hospital for further injury. While the majority of insurances will offer home health care, some insurance plans don’t cover these services. It is important that family members perform their due diligence when it comes to picking a home care agency. Talking to your Physical Therapist prior to surgery can be helpful. The therapist will put you in touch with an agencies that can help research if you will be covered. This will assist in the continuity of care following surgery and also eliminate stress that is potentially debilitating to recovery. 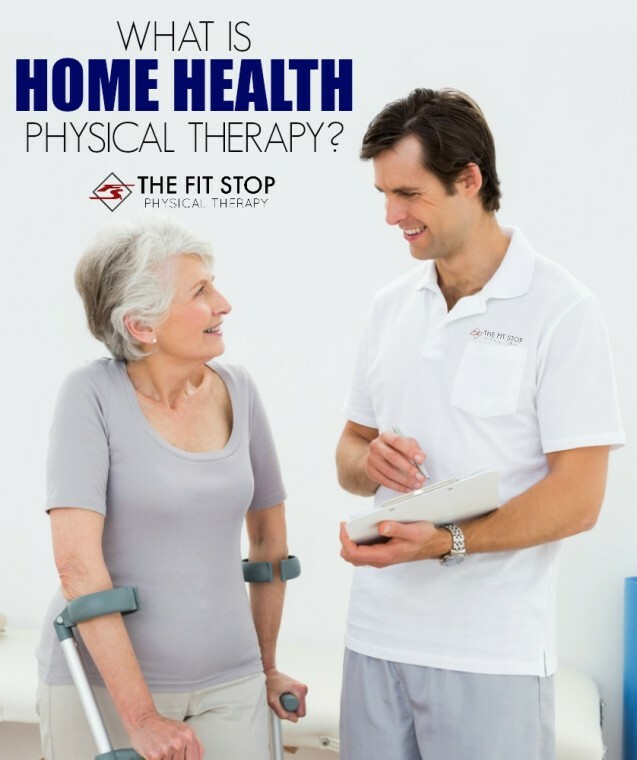 The therapists at The Fit Stop Physical Therapy provide in-home therapy services. Patients can be seen at home following surgery prior to the transition to out-patient therapy. If you have any questions or if there’s anything regarding home care physical therapy, please contact us and we can discuss these services.